As fine as an actual taxidermy specimen yet 100% artistic sculptural creation with no real animal parts! This serpent will inspire an awesome appreciation of the creature after that initial startle. 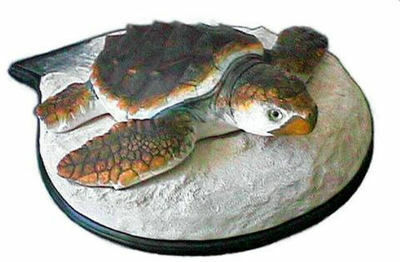 • The artwork is cast with hand painting to a very natural look. • Cast 'Poxy-porcelain©', a unique artist's blend of high strength, durable and nontoxic artists' materials. • World wide collected artist producing fine details and quality of craftsmanship; made in USA exclusively by Chris Dixon Studios. Watch out! This snake is one reptile that is ready to strike at your imagination. Truly a magnificent life cast sculpture reproduction. The museum quality original was designed by renowned artist J. D. Hay. Water Moccasin or Cottonmouth Snake sculpture: (Agkistrodon piscivorus) the Western Cottonmouth or (Agkistrodon leucostoma) the Eastern, and the Florida Cottonmouth. Ssssssss made in USA exclusively by Chris Dixon Studios."